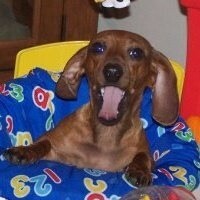 My mini Dachshund by error was mated with a Doxie Pom. The Doxie is a short haired standard size and the mini Dach is full blooded. What can I expect from her litter? Will the dachshund be predominant? Thank you. While there is no way to tell for sure before their birth, with 3/4 of the genes coming from dachshunds, they shouild favor doxy over pom. I am sure the puppies will be adorable, but please have your dog spayed. You have seen how easy it is for female dogs to get pregnant. There are so many dogs sitting in shelters needing homes, we don't need more dogs looking for homes. Please think about that.